After a demanding climb up Cefn Modfedd you leave the old route and head south to begin the largest new section of the Trail. Walking through woodland on Ffridd Rhiwlwyfen the Trail takes you round to the far side of Machynlleth, a vibrant little town with a rich history, to enter the town via the “Roman Steps.” Owain Glyndwr was crowned Prince of Wales and established a parliament in Machynlleth in 1404. From the Owain Glyndwr centre in Machynlleth the Trail starts with a 3 mile stretch along a minor road south east to Forge and onto Abercegir. From here the Trail once again climbs up onto open moor with views of the Cadair Idris Mountain before descending once again into Cemmaes Road. 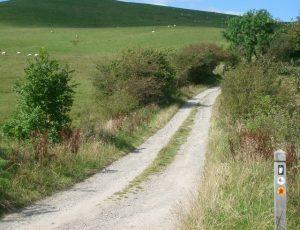 This part of the Trail is a true delight through rolling hills and scenic valleys. The initial climb from Cemmaes Road is quite steep, though the rest of this section is relatively easy. Leaving Llanbrynmair the route takes you northwards on a new section of the Trail under the railway line. It soon takes you up a steep hill, but the climb is worth it, for the views of the valley below. The route continues along a forest trail before rejoining the old Glyndwr’s Way. You soon climb to the edge of Pen Coed and across a particularly lonely stretch of bracken covered moor. The route now takes you through the huge plantation of Dyfnant forest. Llanwyddyn caters to a steady stream of visitors to Lake Vyrnwy and its impressive 33 arched dam.